07:45 - 08:30: Our guide picks you up at hotel and takes 3.5 hour scenic drive to Ha Long city. Have a break 20 minutes en-route to free your legs. 13:00: Receive a cruise briefing then savor delicious lunch while cruising among wonderful limestone island. 15:30: Stop at Soi Sim Island one hour for swimming, sun-bathing or getting a panoramic view on island peak. 16:30: Do kayaking among hidden parts and around Bo Nau cave to discover mysterious beauty of Ha Long. 17:30: Drop anchor in a calm water area, rest on the sundeck to enjoy Ha Long views at sunset. 19:00: Have Dinner on board. Have fun with Karaoke singing, or try your luck with squid-fishing. Overnight on Dragon Cruise in the middle of Ha Long Bay. 07:00:Start your new day with complimentary tea or coffee, enjoy breakfast on board. 08:45:Get changed onto a day-boat and cruise to an emerald water of Lan Ha bay area for second day activities. 10:00:Get on Monkey Island, if lucky you can see wild monkeys and endangered white-headed langurs. 11:00: Stop at Viet Hai harbor. Enjoy 5km cycling ride through wonderful jungle to Whisper of Nature Bungalow in Viet Hai village. Do a short trek inside Cat Ba National Park. 13:00:Do cycling 5 km back tothe harbor again. Enjoy barbecue lunch on board in Lan Ha bay. 15:30: Arrive Beo harbor for a bus drive to Cat Ba island. 07:30: Have breakfast in your hotel. Enjoy the morning landscape of Cat Ba island and photograph nice pictures. 08:00:Check out hotel. Bus takes you to harbor and get on the transfer boat to Ha Long Bay again. 09:30: Get changed onto Dragon Cruise. Relax on sundeck for sun-bathing while sailing back to the harbor. 13:30: Say goodbye to Ha Long bay then return to Hanoi. Have a rest half-way to free your legs. 17:30: Get dropped off at your hotel. Cooking class, some local wine, fresh fruit on board in the afternoon. 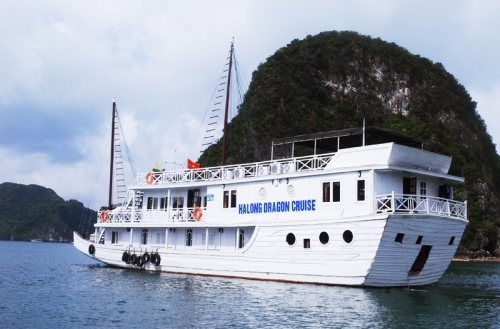 Deluxe type: One night at Dragon Cruise (3 stars) and one night at 4 stars resort in Cat Ba island. Please provide name of hotel and hotel address in Hanoi, Vietnam where we can be free pick-up by email sales@vietfuntravel.com or call us +84 (0) 909 759 479. Please bring your passport for check-in hotel/cruise in Halong.